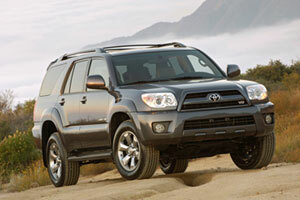 Toyota's venerable midsize SUV offers a special SR5 Trail Edition option for the 2009 model year. Available only on 4Runners equipped with the 4x4 V-6 powertrain, the package includes a locking rear differential, Active Traction Control system, Bilstein shock absorbers, 16-inch wheels with P265/70R16 tires, color-keyed grille and door handles, black tubular side steps and roof rack, special badging, water-resistant seat material, steering wheel-mounted audio controls, a portable TomTom navigation device and an audio system with MP3, Bluetooth and iPod capability or connectivity. 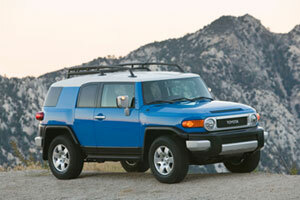 Toyota resurrected its iconic utility vehicle as a 2007 model. For the 2009 model year, the V-6-powered off-roader gets an update that includes active (anti-whiplash) headrests and rollover sensors. It also gets an optional rearview camera and three new colors: non-metallic Black, Silver and Iceberg White. The Highlander is Toyota's Camry-based crossover utility vehicle that offers 3 rows of seats on a rather compact footprint. The Highlander was redesigned for 2008, when it launched its second generation with new exterior, interior and other features. The only change for the 2009 model year is the availability of a 2.7-liter 4-cylinder engine on non-hybrid models (February 2009). 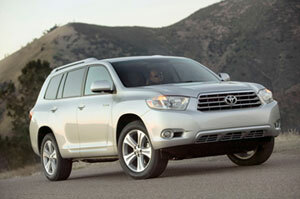 The standard Highlander carries a 270-hp, 3.5-liter V-6 engine. 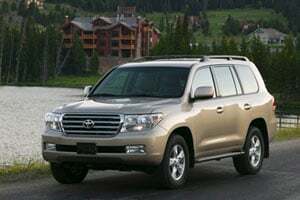 Toyota's Land Cruiser was all-new for the 2008 model year and the only change made for 2009 is the addition of "privacy glass" for the side and rear quarter windows. The big sport utility draws power from a 270-hp, 3.5-liter V-8 engine. Toyota's compact crossover utility vehicle undergoes a major update for the 2009 model year with a new grille, bumper and tail lamps, new exterior trim and some new colors: Magnetic Gray Metallic, Pyrite Mica and Sandy Beach Metallic. On the inside, there are new seat fabrics as well as Charcoal leather, an optional power driver's seat for the Limited and Sport models, available satellite radio and new navigation option for the Sport and Limited versions, active (anti-whiplash) headrests, and a back-up camera. Under the hood there's a new 2.5-liter 4-cylinder engine. 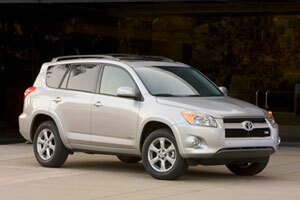 A new Sport Appearance package for the RAV4 includes a V-6 engine and 4WD. 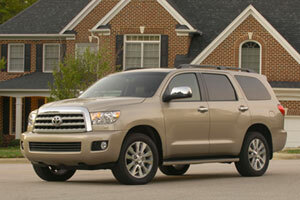 The Sequoia is Toyota's biggest SUV and was all-new for the 2008 model year. For 2009 it gets a 5.7-liter V-8 engine that can run on E85 (ethanol) fuel in states that do not use California emission regulations. It also offers a Sport Appearance package (available on the SR5 5.7-liter 4x2 and 4x4 models) that includes 7-passenger seating, 20-inch alloy wheels, a sport grille, rear spoiler, power driver's seat, black fabric interior and the buyer's choice of Super White, Silver Sky or Metallic Black paint. 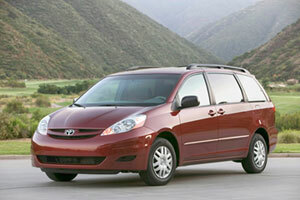 Toyota's popular minivan gets new headrests and some new interior trim for the 2009 model year. The upscale XLE version gets front and rear sonar (proximity) sensors. The base LE model gets new 17-inch wheels and an option package that includes a third-row passenger seat with an entertainment system. The Sienna continues to offer buyers either FWD or AWD systems, all powered by a 3.5-liter V-6 engine that pumps out 265 hp. Toyota's midsize pickup truck gets four new exterior colors-Magnetic Gray, Barcelona Red, Pyrite and Timberland-plus complete Star system safety features, side and curtain air bags, active (anti-whiplash) head rests and either an automatic or mechanical limited-slip differential. The interior has been updated and upgraded. Air conditioning will be offered as a stand-alone option on regular cabs. Access Cab and Double Cab models will offer optimal backup monitors. The Access Cab model gets a new back seat with center and under-seat storage. Standard equipment includes a single CD player, MP3 capability and optional satellite radio with an optional JBL 6-disc CD changer with three months of XM satellite radio and Bluetooth hands-free telephone. 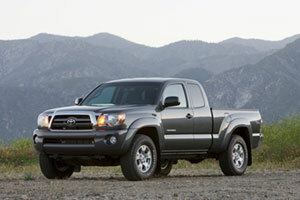 Toyota's full-size pickup truck comes in 2WD and 4WD and various cab and cargo bed configurations, with V-6 engine or one of two V-8 engines. 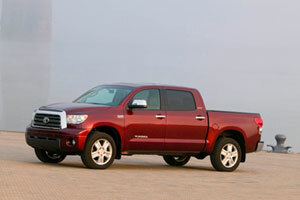 For the 2009 model year, all Double Cab and CrewMax models get chrome bumpers. SR5 buyers have their choice of bench or bucket seats up front. Tundras with 4WD and 5.7-liter V-8 engines get standard E85 (ethanol) FlexFuel capability. Two new option packages are available: TRD Sport with special wheels and color-keyed exterior and TRD Rock Warrior with special off-road suspension. Each package includes special exterior paint colors. 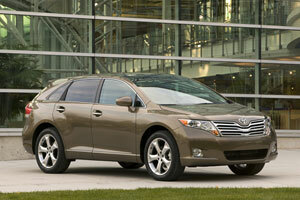 The Venza is a new, Camry-based crossover vehicle. The design goal was to look less like a boxy SUV and more like a sports sedan with an angled rear hatch in place of a trunk. Inside, Venza provides both cargo capacity and rear seat backs that can recline by as much as 14 degrees to enhance passenger comfort. 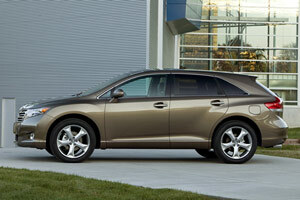 Venza will be the first Toyota "sedan" equipped with the same Star safety system as Toyota sport utility vehicles. It also will have seven standard air bags and will be, the company says, the first Toyota of any architecture with automatic high-beam headlamp dimmers, an optional panoramic sunroof and standard 20-inch wheels.